It’s confirmed — Knoxville’s second Flock meetup will take place at 7:00 p.m. on Wednesday (tomorrow) at the Barne’s and Noble on Kingston Pike (yes, we do know about books here in the south). We’ll gather in the cafe area. We’re a small group so far (but bigger than last time), and anybody in the area is welcome to stop by. 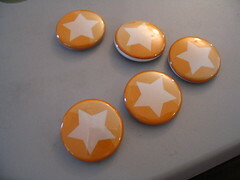 I’ve got some nifty buttons to give out and, FedEx willing, I’ll have one or two tee-shirts that people can fight over. Other than that, we’ll just talk Flock. I hope to have a chance to give an overview of things to come and to answer any questions I’m able to about where we are with the software. Admittedly, since I’m on the web end of things now rather than the client side, my knowledge on that front is more limited than in the past. In any case, it should be a good event. Naturally, unless it’s a real snoozer, I’ll report on how it went. Consider this an invitation to other community members to hold meetups and to do status reports afterward. You’ll have to check this with Community Ambassador Will Pate, but I gather we’re getting much closer now to being ready for spread-like campaigns, and meetups seem to me like as good a way as any to participate.